It is high season for reports and studies relating to piracy. The latest World Bank report, Pirate Trails, which follows the recent IMB annual report on the number of piracy incidents as well as the UNSG situation report on piracy in Somalia, is dedicated to the largely unchartered topic of the illicit financial flows of Somali piracy. So far, apart for the disappointing report of the UK sponsored International Piracy Ransom Task Force, little public attention has been paid to tracking and disrupting the financial flows generated by piracy through the payment of ransoms for ships, crew and their cargos. Pirates, defined in the report as hostis humani generi (but wrongly attributing this definition to Cicero) have been capable of modernizing their actives and developing specific business models that adapt to the situation in which they operate. In Somalia, alongside pirates who attack and board ships crossing the Gulf of Aden, a sophisticated network of investors, local and foreign financiers and shareholders, but also negotiators, interpreters, guards, cooks and drivers, flourished and profited from piracy. The report estimates that US$339 million to US$413 million was claimed in ransoms between April 2005 and December 2012 for pirate acts off the Horn of Africa. With low level pirates typically netting a pre-agreed fee between US$30,000 and US$75,000 (about 0.01–0.025 percent of an average ransom payment), the pirate financiers who invested in the piracy operations receive the bulk of the ransom, estimated at 30–75 percent of the total ransom. Ransom payments can be invested locally, generally by low level pirates but increasingly also by financers, or moved by financial transfer, particularly to Djibouti, Kenya, and the United Arab Emirates. Most of the money is moved by cross-border cash smuggling, made easy by the porosity of the borders in the region and trade-based money laundering. Money transfer services are also exploited to move money outside Somalia. Depending on the profit made, ransom money may be used to fuel other illicit activities in the region. Some pirate financiers are engaging in human trafficking, including migrant smuggling, and investing in militias and military capacities in Somalia. To launder their proceeds, pirate financiers can also buy into legitimate business interests, particularly the real estate market. Allegations that ransoms payments fueled the real estate prices in the region are not new, although any definitive evidence has yet to be shown. Other legitimate businesses in trade (for example, trade in petroleum), transportation, and the services industry (for example, restaurants, hotels, shops), also offer viable opportunities for the pirates to invest the proceeds from piracy, depending on the profit originally made. Khat (also commonly referenced to as qat, qaad, gat, jaad, tchat, and miraa) is a small leafy plant. Among communities in the Horn of Africa and the Arabian Peninsula, the chewing of khat is a social custom dating back many thousands of years. Interestingly, the report sheds light of the role played by the trade of Khat, a mild stimulant popular in Somalia and very popular among pirates, in the financial flows generated by piracy. Khat is provided on credit to low level pirates throughout highjack operations. Its use is recorded. When ransoms are finally paid, the debt accumulated by the pirates during the captivity period is paid back by subtracting it from their share of the profit. In light of the potential profit to be generated, pirates are ready to pay their khat’s provisions at a price well above the market price. There is more. 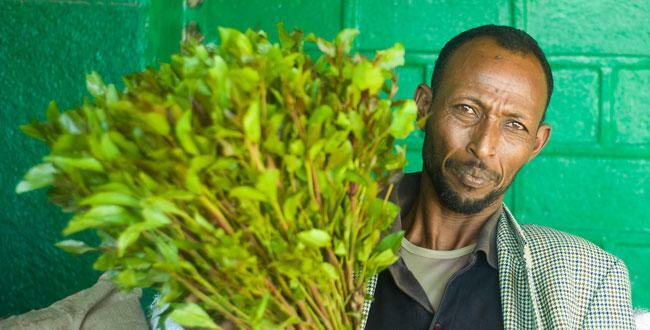 Given the lucrative nature of the trade, which predominantly cash-based, the traditional culture of khat chewing in Somalia, and Somalis’ control over the distribution network, pirates are also investing their profit and increasingly buying into this multi-million dollar business. Khat trade with northern Kenya, in particular, is largely unregulated and is becoming fertile ground for the pirates’ business interests in this sector. An estimate of nine tons of khat is flown daily from Kenya to Mogadishu. The report recommends the regulation of the khat trade as one of the means to disrupt piracy financial flows in the region. Considering the pirates involvement in the growth, distribution and consumption of khat, however, the khat trade may already be an effective indicator of the pirates financial and laundering activities. Monitoring this business can therefore add to the efforts to track the pirates network upwards to their financiers within and outside Somalia. On November 17, a Malaysian-owned chemical tanker was hijacked in the South China Sea by a group of Indonesian pirates and taken to Vietnamese waters. After the International Maritime Bureau sent out an alert, Vietnamese authorities re-captured the vessel (which had been repainted and reflagged) and arrested the eleven suspected pirates on November 22. The nine crew members who were on board the hijacked tanker were forced into a life raft and released at sea on Wednesday. They were all rescued by local fishermen. This attack, the hijacking of a laden tanker, is said to be the first of its kind in the region in several years. As previously reported here and here, Indian Ambassador Hardeep Singh Puri holds the UN Security Council presidency this month, and convened the first Security Council debate on the general threat to world peace and security posed by maritime piracy. Puri stated that forty-three Indian citizens are currently being held hostage by pirates, and it is estimated that piracy costs the maritime industry at least $6.6 billion annually for security. U.N. Deputy Secretary-General Jan Eliasson said that countries who are involved in counter-piracy operations need better communication with each other, and called for an agreement on the rules regulating the placement of private armed guards on merchant ships. U.S. Ambassador Susan Rice asserted that no ship carrying armed guards has been successfully hijacked, but the merits are controversial. Russian and Italian private guards have inadvertently fired on and killed fishermen off the coast of Somalia, mistakenly believing they were pirates approaching with the intent to board. French Ambassador Gerard Araud emphasized the greater deterrent effect that government-posted naval patrols have in warding off attacks. He also stressed the fact that about 80% of those arrested on suspicion of piracy are released without facing any prosecution, and that there is a need for a more efficient system of justice. More than twenty different nations have apprehended pirates off the coast of Somalia, and without a system in place to handle those arrested, many have simply been released back to Somalia. Though piracy is down this year, it is widely accepted that there must continue to be a strong focus on counter-piracy measures, or attacks will increase again. The following day, the Security Council renewed authorizations put in place in 2008, which were developed to allow international cooperation in the fight against piracy. The Council emphasized the role Somalia is expected to play in these efforts and requested that the nation pass a complete set of anti-piracy laws. It also called on all member states to fully criminalize acts of piracy and assist Somalia in its implementation of more effective policies to combat the problem. The development of specialized anti-piracy courts in Somalia and other similarly affected states was termed a priority. South Africa’s representative, while agreeing that the adoption of these measures is an important step, emphasized that as a whole the efforts ought to include measures to combat the root causes of piracy in order to stop it before it starts. The International Maritime Bureau reports that as of November 20, there have been 261 total attacks worldwide and twenty-six hijackings worldwide so far this year. Of those numbers, Somalia accounts for seventy-one incidents and thirteen hijackings, with 212 total hostages. Currently, Somali pirates hold nine vessels and 154 hostages. Three vessels from Russia’s Pacific fleet are en route to replace Russia’s current deployment in the Arabian sea and take over their counter-piracy patrols in the area. This flotilla is the eighth sent from Russia since they joined the international anti-piracy operations three years ago. During this time the Russian Navy has escorted more than 130 commercial and aid ships through the Red Sea and other pirate-infested shipping lanes off Africa. NATO’s counter-piracy ships in the Indian Ocean are focusing this week on patrolling waters along the shore of Somalia. Teams have employed smaller rigid-hull inflatable boats to approach the skiffs and fishing boats run by Somalis to exchange information with them regarding the continued presence of patrolling warships in the area. This campaign is undertaken with the intent of discouraging would-be pirates from beginning the enterprise at all, before they launch their boats. Though the increased presence of patrol ships and better communication between merchant vessels has made it increasingly difficult for pirate boats to remain unseen at sea for extended periods of time, the hope is that making the naval presence more well-known close to shore will discourage pirates from setting out to sea at all. Speakers at the Maritime and Coastal Security Africa 2012 conference held in Cape Town last week discussed the variety of factors that have caused a recent drop in the number of pirate attacks carried out this year [from increased presence of warships and patrols to enhanced communication regarding pirate sightings and the placement of armed guards onboard merchant vessels]. Jason Marriott-Watson of the maritime security company ISPS Group asserted that the recent seizure of the Somali port city of Kismayo from al-Shabab militants was a major cause of this decline. Kismayo had been a stronghold for Somali pirates until control was taken from the group, which is linked to al Qaeda. Many of the al-Shabab militants were arrested by the African Union forces who wrested back control, which were led by Kenyan troops. 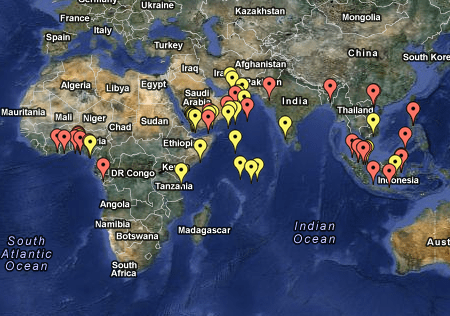 Worldwide, pirates have killed at least six crew and taken 448 seafarers hostage this year. The IMB reports that 125 vessels were boarded, 24 hijacked and 26 fired upon while there were 58 attempted attacks. These numbers are the lowest reported since 2009, when maritime piracy was at its height. They show the success of the effort undertaken by the international community to put pressure on those committing acts of piracy, but many organizations say the need for vigilance has not decreased and warn against complacency. As reported here, in October pirates off the coast of Somalia fired at a small boat deployed from the HNLMS Rotterdam as part of its routine patrolling operations. After the ensuing fire-fight and rescue operation, the fishing boat’s captain revealed that he and his crew, along with their ship, had been hijacked off the coast of Oman several weeks earlier. The captain identified six of the people rescued from the water after the fishing boat caught fire as the pirates who took them hostage. Four of those men are now set to be prosecuted for their acts of piracy in Dutch court, as the marines they fired at from the Rotterdam were from the Netherlands. The two remaining suspected pirates were released, as they are minors. Two pirates and six of the original crew-members from the hijacked boat were wounded in this altercation, and one crew-member was killed. Two of the crew from the fishing boat are reportedly missing at this time. Fifteen pirates were sentenced in the Republic of Seychelles on November 5 after being convicted for acts of piracy in attacking a merchant ship and abducting thirteen Iranian fishermen. The US praised Seychelles for their leadership in prosecuting those suspected of piracy, and reported that there have now been 631 convictions against pirates worldwide, with 98 of those coming from Seychelles. Additionally, 440 suspected pirates are currently facing justice in 21 countries. After being held by Somali pirates since they were captured last November, two Seychelles fishermen were released early this week. The office of the President in Seychelles confirmed that after extensive effort and negotiations the two hostages had been released. A Somali pirate allegedly reported that a $3 million ransom was paid for their release, but this has not been confirmed. Since February 2009, pirates have hijacked five Seychelles boats, and eleven hostages have been kidnapped and subsequently released. The Australian Navy sent its newly constructed warship on a 12,000 mile detour around Africa in order to avoid the possibility of being attacked by pirates while travelling through the dangerous waters in the Gulf of Aden. Though it likely would have taken about two weeks and $2 million less for the ship to make its journey from Spain to Australia through the Suez canal, the danger of encountering pirates on that route outweighed concerns regarding the time and expense of moving the ship to Australia. Other options were considered to thwart the possibility of pirate attacks, including sending a Navy frigate alongside the other ship and placing armed mercenaries onboard, but it was decided that the most effective method would simply be to take a safer route. That these measures were considered necessary is a clear indication that the cost of piracy is quite high. Thursday marked the opening of a two-day Maritime and Coastal Security Africa conference in Cape Town, South Africa. A primary goal of this conference is to discuss better approaches to enhancing cooperation among different nations in the counter-piracy efforts being carried out. This concern arises due to the fact that nearly all African countries are major exporters of oil, and as such there are a large number of merchant vessels carrying valuable cargo all around Africa. These ships are attractive targets for pirates seeking to commandeer the cargo or hijack these ships and their crew for ransom, so the need to police these waters is ever-present. According to the International Maritime Bureau, as of October 27, there have been 252 attacks and 26 hijackings so far in 2012. There have been 71 incidents, 31 successful hijackings, and 212 hostages taken by Somali pirates. Currently, Somali pirates are reportedly holding nine vessels and 154 hostages. Recent trends indicate that piracy around Somalia and in the Gulf of Aiden is becoming less prevalent. Through September of this year Somali pirates have reportedly carried out 70 attacks, down from 199 in the same period of 2011. These attacks are becoming less successful as well – in 2011 about one in three attempted raids were successful, while now the figure is closer to about one in 20. Armed guards onboard ships, the presence of patrolling warships in the region, and onboard security measures such as barbed wire are among the efforts credited with this decrease in piracy. However, agencies such as the International Maritime Bureau continue to warn against complacency, pointing out that Somali pirates alone still hold 11 ships and 167 crew members hostage. More than 20 of those hostages have been under the control of their captors for over 30 months. The IMB also reports that it calculates the global cost of piracy was $12 billion in 2010, which is a clear indication that continued efforts to impede the ability of these criminals in carrying out acts of piracy is essential moving forward. Along with this decrease in pirate activity off of East Africa, there is a growing threat in West Africa around the Gulf of Guinea. As the international community has put an increased effort into protecting merchant ships in other hot-spots, the threat of maritime piracy is spreading farther and affecting areas previously thought to be fairly safe. Specifically, reported attacks have more than doubled off of West Africa so far this year from those reported in 2011. Oil production is growing in countries such as Nigeria, and as a result shipping traffic is increasing, creating a new “market” for those seeking to hijack boats and seize cargo for profit. Since August at least three large tankers have been attacked, and about 10,000 tons of oil have been robbed from those ships. Up until recently it was considered relatively safe for large ships to anchor for days at a time and carry out ship-to-ship transfers near Ivory Coast, but recent attacks there indicate that the reach of maritime piracy is spreading quickly.Though prior attacks have often focused on holding a ship and its crew hostage for ransom, these goal in these recent incidents appears to be the appropriation of oil to be sold on the black market. The more widespread area in which attacks have occurred, and the fact that many have taken place much further out to sea than in the past, shows that these are sophisticated pirates with access to larger ships, greater resources, and information on ship movement. Over the weekend the Nigerian Navy and the Nigerian Maritime Administration and Safety Agency (NIMASA) met to strengthen efforts under a memorandum signed a few years ago outlining the need for counter-piracy measures. The meeting was prompted after a presidential directive to end illegal activities (specifically maritime piracy and sea robbery) in Nigeria was handed down. The hope is to more effectively police the waters around Nigeria through increased cooperation and resource-sharing between the two agencies. On Monday senior officials from the US, India, and Japan met for the third time to formally discuss strategies for combating piracy and bolstering maritime security. The three agreed to increase efforts in combating piracy through greater cooperation. India took over the rotating Presidency of the United Nation Security Council (UNSC) this week. Hardeep Singh Puri, India’s Representative to the UNSC, has already indicated that India will use its post to seek a “comprehensive anti-piracy strategy to tackle the maritime menace.” Maritime piracy clearly presents a significant challenge to the international community and its effects are felt especially strongly in India and the surrounding region, so Puri intends to cultivate debate on the topic of how the UNSC will address piracy as an international crime. While patrolling the waters off the coast of Somalia on Wednesday the HNLMS Rotterdam, NATO’s counter-piracy flagship, destroyed a pirate fishing boat. The Rotterdam had deployed a boarding team to check out the boat, and upon confronting those aboard the ship the team began to take fire from fighters on the boat and on land. The fishing boat aroused suspicion as it was the type generally employed to transport pirates in their efforts to hijack larger merchant ships. The attack on the boarding team prompted the Rotterdam to return fire, which resulted in the fishing boat catching fire. Those on board were forced to flee into the sea, and despite continuing to draw fire from those onshore the Rotterdam proceeded to rescue at least 25 people from the water. One person was found dead, and it is unknown whether they were a pirate or being held hostage. It is also unclear how that person died. The Rotterdam suffered only minor damage and no one from the Dutch warship was injured. In December of 2010 the MV Orna, a UAE-owned cargo vessel, was hijacked by a group of Somali pirates about 400 nautical miles North East of the Seychelles in the Indian Ocean. Since then the ship has been held hostage, along with the crew members who were taken with it. After growing impatient following nearly two years of attempting to collect a ransom for the return of the Orna and its’ crew, it has been reported that one of the hostages was killed in late August of this year. This killing was allegedly carried out in an effort to prompt a ransom payment, though the truth of the story has recently been disputed by a technical advisor to the ship’s management company. If true, this act is believed to have been the first killing of a hostage by Somali pirates, as generally hostages are held unharmed until ransom is paid. Last Saturday the vessel and 13 of the 19 crew believed to have been aboard were finally released following a ransom payment reported to be between $400,000 and $600,000. The ship’s captain, the chief engineer, and four other crew members were not released, and are still being held hostage. It is believed that their captors are divided into two separate groups, who disagree over the amount of money they require in order to release these remaining six hostages. The remaining hostages are being held by piracy investors, who support piracy by providing food and security for hostages during negotiations in return for a portion of the ransom. Negotiations are continuing between these piracy investors and the UAE company that owns the Orna. The UAE’s National Transport Authority (NTA) announced a new anti-piracy security system it will be implementing. As part of the security measures being taken, tracking devices are being installed on commercial ships bearing UAE flags and carrying over 300 tons of cargo. This will allow these ships to be monitored around the clock from offices in Abu Dhabi and Dubai. According to the NTA, 150 ships have already been outfitted with the system, which will soon be installed on about 800 more. In addition, the system implemented by the NTA will provide on-board security protection for these vessels to further discourage piracy attacks. The International Maritime Bureau reported this week that the number of reported attacks by Somali pirates has dropped to its’ lowest point since 2009. This is largely a reflection of increased efforts on the part of the international community to police the waters of the Arabian Sea around Somalia, focusing on patrolling the Gulf of Aiden. Along with this drop in pirate activity around Somalia there has been an increase in the number of attacks in other areas, including the Gulf of Guinea, Indonesia, and other parts of South Asia.